Alea Lacta Est/Controlled Existence - Split 7"
Alea LActa Est bring 6 tracks of crustgrind (including an Insect Warfare cover) and Controlled Existence deliver 8. Raw and nasty crust punk. 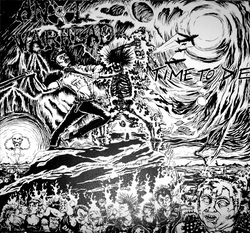 Grindcore/fastcore split. Loads of songs on this 7 inch. 8 tracks of killer Swedish crust. 3 tracks of grinding crust from both bands. 6 tracks of nasty, screaming sludge/grind/crust. On clear or solid orange vinyl. The Atrocity Exhibit/Catheter - Split 7"
Two tracks from each band, one original one cover. The Atrocity Exhibit give it some Motorhead with a shot at Civil War whilst Catheter enjoy some Onslaught covering Thermonuclear Devastation. 6 tracks of blistering Japanese crust. Can't find any sound clips for this one, sorry.